Despite producing mixed results for sustainable agriculture interests, President Obama’s 2015 budget request is an encouraging sign that the federal government is getting serious about climate change, and particularly about adapting to its impacts. The President’s proposal includes a $1 billion dollar Climate Resilience Fund, which is intended to strengthen preparedness of states and communities for increasingly extreme weather like floods, droughts, and wildfires. The fund would support investment in research, technologies, and infrastructure across numerous agencies and sectors, including agriculture. Of course, we need not look far to find proof of the urgent need for such an initiative. 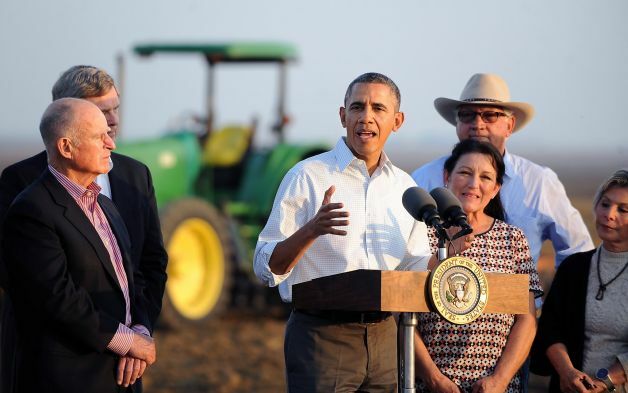 Word of the fund first came out in February, when Obama met with growers and ranchers in the San Joaquin Valley, the heart of drought-stricken California. While touring the farm of Joe and Maria Del Bosque, who have fallowed their melon fields due to water shortages, the President emphasized the role federal support could play in alleviating drought impacts and preparing for the future. More and more, the President’s administration seems to be acknowledging the link between climate change and adaptation needs in agriculture. Last month’s visit from the President followed close behind Agriculture Secretary Tom Vilsack’s announcement that the USDA will be launching seven ‘Climate Hubs’ across the country, intended to “deliver science-based knowledge and practical information to farmers, ranchers and forest landowners within each region of the United States to support decision-making related to climate change.” (See the USDA fact sheet). These centralized facilities aim to provide access to tailored information on climate risks and vulnerabilities, as well as technical support for dealing with impacts like drought, longer growing seasons and new pests. The hubs will also facilitate outreach with key partners including land grant universities; private sector organizations; state, local and regional governments; USDA researchers; and Oceanic and Atmospheric Administration (NOAA) and Department of Interior (DOI) climate experts. A ‘sub-hub’ based at UC Davis will focus on climate change issues facing specialty crops and Southwest forests. It is uncertain exactly how the Climate Hubs will be funded, however, and USDA Climate Change Program Office Director Bill Hohenstein has declined to comment on the overall estimated costs of the program. Meanwhile, the 2015 budget request for USDA comes in at $23 billion – about a billion dollars below FY2014 levels. The Climate Resilience Fund is an obvious place to provide needed financial support to the Climate Hubs, but it remains unclear as to whether the President intends for the Fund to provide that support, and also whether Congress will approve the expenditure. A growing acknowledgement of the link between climate change and agriculture on a federal level is heartening, to be sure, but it is worth noting that the budget plan leaves significant room for improvement with regard to sustainable ag programs more generally. Funding for Environmental Quality Incentives Program (EQIP) in the budget plan cut $250 million out of the amount signed into the Farm Bill mere weeks ago, and for the first time in five years, the president did not propose an increase in funding for the Sustainable Agriculture Research and Education Program (SARE). For a full overview of what the budget request means for sustainable ag interests, click here. Beyond agriculture, the budget proposal pushes forward many of the measures outlined in last year’s Climate Action Plan, particularly highlighting the need for EPA regulations on fossil fuel emissions from power plants. It directs funds towards clean energy production tax credits and technology, wildfire research and suppression, a new fleet of weather satellites, and research on infrastructural vulnerabilities to climate change. It also makes cuts to the tax breaks currently enjoyed by oil and gas companies. President Obama has continued to emphasize both the environmental and economic realities that call for climate legislation and adaptation planning. Although his budget proposal will likely face stiff resistance from a divided congress, it is nonetheless an encouraging step towards federal policies that take climate change seriously. Read about California’s plans to improve agriculture’s resilience to climate change impacts in our recent blog here.